Summary: The Turtle Hospital admits between 50 and 70 sick and injured sea turtles every year. This influx of turtles is most prevalent during the spring and summer months. The Turtle Hospital has been relying on five temporary vinyl tanks for the last two years to provide for the overflow of patients. These temporary tanks have been adequate on a short term basis but are too small for some of the larger turtles. Additionally, these five tanks are substandard to the other tanks in the facility. Fiberglass tanks can be cleaned and sanitized because of the hard gel coat surface. The vinyl tanks have a more porous surface and tend to hold more bacteria. Also, the hard fiberglass sides and fiberglass rim allow easy transport of the turtles in and out of the tank. Large turtles can be supported on the rim of the tank to allow personnel to safely move the animal in and out of the tank. Vinyl tanks are flexible and do not allow for this added safety. 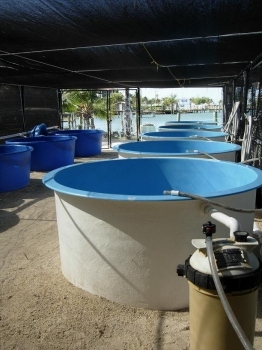 Additionally, The Turtle Hospital maintains an open water system which is driven by two high-powered electric pumps. In the event of a hurricane or loss of power, gasoline powered pumps would allow pool filtration to be maintained. These pumps would be easily interchangeable with The Turtle Hospital's current system and maximum water circulation and filtration would be preserved.